What is your automotive guilty pleasure? A guilty pleasure is by definition something you like, but feel guilty about liking because you are aware your fondness for said thing is a little embarrassing or not so great. This weekend we want to know about your automotive guilty pleasure. You know the car, the one you have a hard time admitting you like, but secretly pine after. The vehicle that goes against all of your instincts as someone who is automotive obsessed. The one that isn't particularly cool or interesting or fast or desirable yet for some reason you are still strongly drawn to. What is your automotive guilty pleasure? 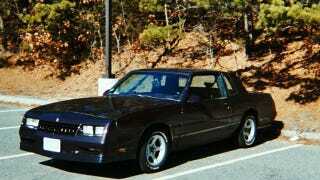 My automotive guilty pleasure is the 1987-1988 Chevrolet Monte Carlo SS. The end was near for rear wheel drive two door passenger car at GM in 1987. Instead of creating one of the coolest vehicles ever made to celebrate the end of an era like Buick, Chevrolet decided to change the taillights and update the sticker package on their not-long-for-this-world Monte Carlo SS and left the terrible 305 "High Output" V8 under the hood. They were slow, the build quality was atrocious and they only came with automatics. The paint was starting to fade before they left the factory in many cases and the problems only continued from there. I've had several and can say without hesitation they were the worst cars I've ever owned. Having said that, I still search Ebay and Craigslist hoping to find "the right one". So far I have avoided some dangerously close encounters with re-entering the world of Monte Carlo SS ownership since I sold the last one several years ago. I would certainly be lying if I said the desire to have another isn't there.